Around this time of year, the media likes to get into the holiday spirit by tracking the “12 Days of Christmas Price Index” as a way to look at the real CPI (consumer price index) through whimsical glasses. If you recall, the song highlights hypothetical gifts that range from a “Partridge In A Pear Tree” to “12 Drummers Drumming”. For the year 2009, the cost increase of the 12 Days of Christmas rose a minute 1.8% compared to 2008, reflecting the impact of the recession on the economy. The price for all the gifts for your true love during that holiday season rang in at $87,402.81. This was the total cost of all the gifts mentioned in the song from the 1st through the 12th day. If you only bought one of each item, you’d only be out $21,465.56. But how are these costs tallied? The Christmas Price Index was actually conceived by PNC Financial Services Group, hence its official label “PNC”. In general, the 12 Days of Christmas command quite a hefty gift budget when you consider the absolute value of these items. And interestingly, this unusual price index is used annually as an informal gauge of how consumer prices are behaving, and can therefore give us a feel for the health of our economy. What’s actually cool is that the PNC Financial Services Group has taken these calculations further and designed a site that is entirely dedicated to the Christmas Price Index, where you’ll find several helpful charts that show how gift prices have risen from 1984 (cost: $12,673.56) to 2011 (cost: $24,263.18) — all the while tracking the inflation rate. Please click the chart image below for a look at this site. By 2011, the total PNC has risen to $24,263.18, with the total cost of the items in the entire song topping $101,119.84. And as you’ll see in the table we’ve included below, these items cost so much more if they are instead “purchased” online and delivered to your door, with the Internet shipments of each gift costing almost $40,000 (a 16.1% increase from the previous year). After all, there are shipping costs for the various live creatures in the list. If each instance of the gift in the song is considered, then the total online tab runs almost $175,000, a steep 26.5% increase from 2010! Note that online costs are almost 60% more than if you shopped for these gifts in the traditional manner. Live shipments make shopping online a relatively more costly matter. Partridge In A Pear Tree $184.99 14.2% The cost of this item has fluctuated in recent years. Two Turtle Doves $125 25% Turtle doves were only worth $56 in 2009! Three French Hens $150.00 0% These hens were worth $45 in 2009. Hens are subject to large and sudden price hikes. Four Calling Birds $519.96 -13.3% The price didn’t budge for a while but fell this year. Five Golden Rings $645 -0.8% Gold has been volatile, but stayed even in the past year. Six Geese-A-Laying $162.00 8% Geese are worth almost the same as they did in 1984! 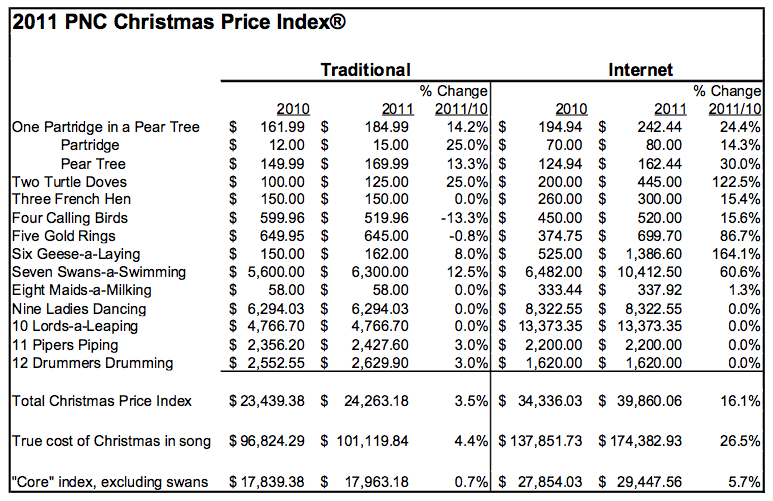 Seven Swans-A-Swimming $6,300.00 12.5% A noticeable jump in price here. Eight Maids-A-Milking $58.00 0% Unskilled labor costs remain stable. Nine Ladies Dancing $6,294.03 0% Employment growth has flattened after rising 30% since 2008. Ten Lords-A-Leaping $4,766.70 0% The cost of labor continues to be flat. Eleven Pipers Piping $2,427.60 3% This appears to track cost of living increases more closely. Twelve Drummers Drumming $2,629.90 3% Again, labor costs are stable. Total (Whole Song) $101,119.84 4.4% A slight but noticeable increase. Total (One Verse) $24,263.18 3.5% A slight increase that’s in line with economic indicators. Some peculiar things I noticed about this index: eight maids a milking cost only $58? Supposedly, it’s because they fall under the “unskilled labor” category. But wow, that’s quite a huge difference in cost relative to what the entertainment sector charges, as represented by dancers, leapers and musicians. In general, the increase in wages has been minimal due to the lukewarm job market, even if you account for a hike in the minimum wage in recent years. And the prices for various types of fowl are all over the map, with swans really commanding major bucks. It’s also nice to see how well our precious metals investments have performed in previous years, with golden rings rising 42.90% in 2009 and another 30% in 2010, although plateauing in 2011! The main takeaway here is that the PNC is showing a total increase of 3.5% from last year, which is actually very much in line with the actual behavior of the CPI (Consumer Price Index). The CPI increased by 3.9% in the past year. So how is it going with your holiday gift giving? How is your Christmas budget holding up this year? For me, my budget has been well under control, since I’m sticking to the practical stuff for my true loves. Created December 16, 2009. Updated December 19, 2011. Copyright © 2011 The Digerati Life. All Rights Reserved. – So with the 12 days of xmas, we had 1.8% inflation this year. – I wonder why we had a massive decrease from 94-95 in the index? Personally, I think the 1.8% is more believable than the CPI rate of around -0.2%. A cute article, but it reminds us that if we don’t think our purchases through, we might pay too much. Excellent news for the ladies: the income gap between men and women is closing! Nine Ladies Dancing cost 15% more. All other (male dominated?) activities can be had for the same price as last year: Ten Lords-A-Leaping, Eleven Pipers Piping, Twelve Drummers Drumming. I think that is such a cute idea they did! It’s interesting to see how the prices jumped in certain years, and even when prices have fallen! Good catch. I wonder if it has anything to do with gender? Or could it be just the “dancing” as a trade that got a hike in pay? Okay, am being facetious here. I need some help regarding selecting gifts. I am looking for an affordable gift for a 10 to 11 year old girl. But her wish list shows items that are above $100 USD. Would you have any suggestions on how to deal with this? Okay, this time I’m not being facetious — but I’d ignore any list that only mentions $100+ gifts. I have 10 year old nieces and nephews and I found a ton of things that were $30 and less. I didn’t find it hard to shop for a 10 year old kid this year; in fact, if any kid I knew demanded more than what I give them, they wouldn’t be getting anything from me in the future. Tough love. Wonderful article. I hope those who purchased gifts did so with diligent and good budgeting. Toys, the bastion of many a gift collection you’ll find under a Christmas tree, are now 55% cheaper vs how they were in 1980, as per the CPI. The number reported is not adjusted for inflation. So what the economists are telling you is that if you spent $100 on a toy before, you’re now just out $45. Electronics are a great deal, with televisions appearing flatter and cheaper than ever. They are now 93% down from their prices in 1980. Small appliances such as toasters, microwave ovens and coffee makers are off 30% as compared to 1998 prices. So what makes all this stuff cheaper over time? Advances and improvements in the process of making and distributing all these goods. You can thank the global economy for these trends; these are the benefits you’ll enjoy from having an open economy. So are you noticing your dollar stretch further this season? Compare the gifts you’re giving this year to the ones you gave in the past. To give some context to that thought … computers are much less expensive than they were 25 years ago. However, the typical American family spends much more on computers per year today than they did in 1985. Why? Because in 1985, the typical American family didn’t buy a computer (cost: $0). If you continue to buy items of a similar kind and quality, you’ll see a decrease in cost over time – but if you buy a good of a better/new kind and quality (Blu-Ray instead of VHS), you’ll probably tread water, or fall behind. Apples may be less expensive than they were in the past, but that doesn’t mean that you can buy an orange and expect to pay less for it than you did for an apple last year. The question now, is how big of tv does someone possibly need?! Interesting! Statistics an be interpreted in many different ways. The federal government’s CPI is questioned by many and how the government creates the unemployment statistics. Your personal experience is all that matters. Remember that you can change your experience. Great article SVB. I definitely have noticed that you get much more for your money. Electronics and fancy ticket items become more affordable all the time. Remember when cell phones were the size of brief cases and were about $1000? Now you have the power of a computer in your phone that fits in your hand for 10% of the cost of those first few cell phones. @Kosmo. I agree that consumers tend to buy the latest and greatest and that is when consumers end up spending more. The normal TV is not enough anymore. At this rate, everyone will have a 3D TV in 3-5 years and you won’t need 3D glasses. Very good points. To Kosmo’s points — we are getting more and more spoiled by the advances we see in goods and technology. Just yesterday, I was over at Lazy Man’s house to see him swap out his “old” 55 inch television that weighed around 200 lbs. to something so much lighter. I was simply astounded by how much that new television was. That thing occupied half his wall and had great picture quality. Before long these things will become light as a feather…. His cost was only $700. Just wow. Just a few years ago, I was paying thousands (I think) on smaller televisions. But when it comes to clothes and food and those other necessities — they just seem more expensive. So who knows. Electronics may just be a whole different animal?